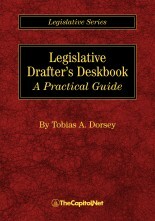 The Legislative Drafter's Deskbook offers practical advice and insight for those engaged in legislative drafting, those more interested in policy than drafting itself, or those interested in reading and interpreting the law. 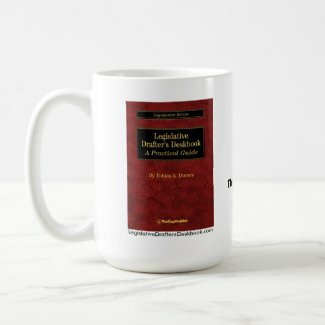 The Legislative Drafter's Deskbook helps anyone understand why laws are drafted the way they are. The Training Edition of Legislative Drafter's Deskbook is included as part of the program materials in our public and custom legislative drafting training courses. Legislative drafting is -- to the extent it is writing at all -- the form of writing used for legislative measures, a category that covers original bills and resolutions as well as amendments. Ultimately, legislative drafting is the form of writing used for enacted law. The focus of this book is on legislative drafting for the Congress of the United States, but many, if not most, of the principles described here apply just as well to drafting for other legislatures. Within the profession, legislative drafting is known simply as drafting, so this book prefers that simpler term throughout. Likewise, this book uses "drafter" to mean one who drafts, "client" to mean one for whom the drafter drafts, and "draft" (as a noun) to mean the text prepared by the drafter for the client. Drafting is done by a wide variety of people with a wide variety of qualifications. Some drafters specialize in drafting, some do not. Some are full-time drafters, some not; some are in public service, some not. A drafter may or may not be a lawyer, though for some of the more advanced tasks, being a lawyer may be useful or even required. The purpose of this book is to provide practical advice on drafting to anyone who does, or may, engage in drafting, and indirectly to provide insight into the drafting process to other interested people. For example, this book is for people who are more interested in policy than in drafting, but want to understand why drafters operate the way they do. It is also for people who are more interested in reading and interpreting the law than in drafting, but want to understand why laws are drafted the way they are. It is hoped that this book will be accessible to beginners while remaining valuable to veterans. The traditional method of training drafters is to train them on the job; the consensus is that drafting is best learned holistically, on a case-by-case basis. For that reason this book is best used as a resource, not a course. It is a supplement to, not a substitute for, the learning that comes from experience. The author has nearly 20 years' experience in writing and the law, first as a journalist, then as a trial and appellate lawyer, and finally as an assistant counsel in the Office of the Legislative Counsel of the United States House of Representatives. (The views expressed here are solely his own.) 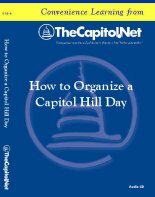 Based on his experiences, the author designed this book to answer the variety of questions about drafting that arise daily in the work of individuals with a professional interest in how bills, resolutions, and laws are drafted. The approach used here is pragmatic: You will find no linguistic theories or esoteric conundrums discussed here. What you will find is solid advice for everyday drafting projects. 1.43 The "Legislative Counsel Type"
6.56 "Shall Not" and "May Not"
10.01 Drafters Who Are "More Than Drafters"
10.13 Who Is Your Client? App. 6.20 The "Rabbit Bill"
TOBIAS A. DORSEY is an attorney in the Office of the Legislative Counsel of the U.S. House of Representatives. Within that office, he works primarily on issues relating to national defense, homeland security, and civil and criminal justice. He has taught at drafting seminars and is an active member of various drafting and professional associations. He serves on the governing council of the Capitol Hill Chapter of the Federal Bar Association. Before joining the office, Mr. Dorsey was a trial and appellate lawyer in private practice. He has brought appeals to the highest State court of Maine and of California and to the Supreme Court of the United States. He has written articles, edited a legal magazine, and directed the in-house research and writing program at several law firms. He is a member of the bar in Maine, Massachusetts, and California, and a member of the bar association of the Supreme Court of the United States. Before becoming a lawyer, Mr. Dorsey was a reporter and editor for several newspapers. He earned his bachelor's degree from Cornell University and his law degree from UCLA School of Law. Mr. Dorsey lives in Maryland with his wife, children, and border collie. Clint Brass wrote Chapter 10, "Working in, and Working with, the Executive Branch". Have a suggestion for the Legislative Drafter's Deskbook? If you have a suggestion for a change or addition to a future edition of the Legislative Drafter's Deskbook, please contact us or complete our online suggestion form. Find Legislative Drafter's Deskbook in a library near you. "The Legislative Drafter's Deskbook is an invaluable resource for any legislative drafter working to hone her skills or student seeking to become proficient in legislative drafting. 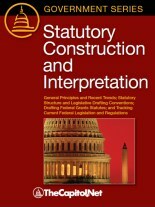 Uniquely among drafting guides, this book demonstrates a sophisticated institutional awareness, devoting substantial attention to statutory methods and techniques that will be used by courts to interpret statutes and to the approach that agencies are likely to take when interpreting or implementing Congress' directives. 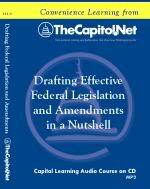 It is clear that this Deskbook was written by an expert with experience in actual legislative drafting; it carefully analyzes the role of the drafter relative to the policymaker and includes helpful discussions of professional norms and expectations. 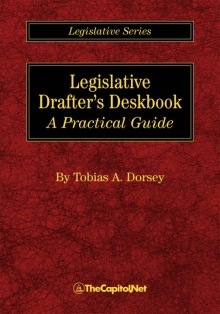 Although the Deskbook is focused on legislative drafting at the federal level, where Tobias Dorsey works in the House of Representatives' Office of Legislative Counsel, the succinct and thorough assessment of good legislative drafting techniques provides a set of 'best practices' for drafters at all levels of government."